Information Resource Management (IRM) represents an imaginative new way of thinking and conducting business in the information age. It is not just another way of using computers. Rather, it is concerned with the development and control of all the resources required to produce information. To many, IRM will represent a radical departure from the mainstream of thinking in today's data processing world which is generally technology oriented. The purpose of this book is to convey to executives a practical approach for the design and development of information resources consistent with their business objectives. Ultimately, the IRM approach demystifies the information systems development process and puts control back in the hands of executive management where it belongs. The concepts and ideas contained in this book represent over thirty years of practical experience in the field and have been proven effective by over 1400 installations around the world. Since 1976, many prominent Japanese companies have implemented these ideas, including top "Fortune 100" companies and several winners of the Deming Prize for quality. The book is priced at $30 (U.S.), includes shipping. NOTE: The following is a free sampling of the book, excerpted from Chapter 1. The day will come when management will recognize the importance of information and learn how to apply it for strategic and tactical advantage. In order to maximize the use of information, it will be obvious to executives that they will need to manage and treat the resources required to produce information in the same manner as other corporate resources, such as financial, material and human resources. These information resources will be standardized and inventoried for control and re-use among applications. Systems will be integrated through the exchange of data and redundancy will be eliminated. The data processing or information systems department as it is known today will be replaced by a vastly different IRM organization headed by an executive called the "Chief Information Officer" (CIO), who will be an officer of the company, not just an impressive job title. Historically, the MIS Director/D.P. Manager reported directly to either a senior financial or administrative manager, which explains why most have accounting inclinations. Unlike his predecessors, the CIO will be an integral part of the management team and will report at the same level as the Chief Operating Officer (COO) and Chief Financial Officer (CFO), by reporting to the Chief Executive Officer (CEO). The CIO will be the information broker and chief information architect for the corporation. Information plans will then be integrated with business plans and objectives. The CIO will be concerned with information from a logical perspective, such as how it will serve the enterprise tactically and strategically. The physical concerns (computers, telephones, etc.) will be a lower level concern. Where will the CIO come from? It will not be from data processing, and it definitely will not be from accounting. Their perspectives are simply too narrow. Tomorrow's CIO will come from the ranks of engineering, manufacturing or marketing, areas with a strong product orientation and a general overview of the business and its mission. Fundamentally, the CIO will be someone with a combination of engineering and business skills. To create an appropriate working environment, the CIO will turn to tried and proven approaches to management. The data processing department will be transformed into an engineering/ manufacturing facility, complete with assembly lines, production control and materials management. Information systems design will no longer be viewed as an esoteric art form, but rather as a science. A business orientation and quality consciousness will replace the programming "hackers" viewpoint of yesteryear. In fact, analysts and programmers will more resemble architects and engineers than artisans. Discipline and organization will replace chaos. The CIO will place emphasis on total information systems, not just the software aspects. Program coding will become less than 15% of the entire development process, with the bulk of the work being expended on business analysis and the development of logical system solutions. Computers will be viewed as just another tool or piece of office equipment. Users and management will no longer fear technology because the CIO will implement it painlessly and thoughtfully into the enterprise. A new generation of information systems will be developed that will revolutionize business. These will be systems that focus on customer service and the streamlining of production. These applications will give business the competitive edge they so desperately need to succeed in the information age. Leading the charge in the IRM Revolution will be the end user who will act as the project manager for these applications. The users will not be intimidated by technical gibberish and will become intimate with all phases of systems development. Those users selected to build these applications will be the champions of the new systems when completed and will represent the rising stars of the business. When this IRM environment has been implemented, the company will experience significant prosperity. Information systems will for the first time serve the business objectives of the corporation. Companies will compete more aggressively. They will be able to change and move the corporation at a speed unheard of in history. Those that implement this environment first will be able to dominate their fields. 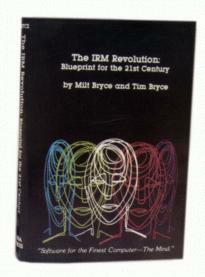 This is the "IRM Revolution of the 21st Century." A totally new way of thinking and conducting business, not just another way of using computers. Why the 21st century? Quite frankly, most of today's management lacks the vision required for IRM and will require re-education to develop this vision. Although the IRM Revolution's real impact will not come to fruition until the early part of the 21st century, it will begin to emerge before the end of the 20th century. Unfortunately, it will not begin in America. In all probability, it will start in Japan. The Japanese seem to be able to grasp the importance of IRM and have adapted it to their style of management where it is already a part of their culture. They will use information as a corporate weapon to expand their dominance over the business world. Already, they have begun to organize themselves into "System Factories" that are churning out advanced information systems for today and the next century. The Japanese challenge will first come in the areas of banking and manufacturing where the systems they will produce will offer unimaginable customer service and quality products. This will be closely followed by engineering systems that will reduce production costs and thereby the price of goods. Also, systems will be built in Japan and exported around the world where they will be installed in Japanese-owned facilities. If left unchallenged, the Japanese will be the dominant force in the business world by the 21st century. The western world cannot afford to spend its time restructuring its companies and resorting to accounting tricks to make things look better on the surface than they really are. The western world must begin to plan from a long-term view as opposed to a short-term, bottom-line point of view which is analogous to "rearranging the deck chairs on the Titanic." It is not too late to change, but it has to occur now. That is the real purpose of this book, to help show the way. Copyright © M&JB 1989-2018. All rights reserved.